John William Streets was born on 24th March 1886 to William and Clara. Will, as he was known to the family, was the eldest of 12 children. He lived at 16 Portland Street, Whitwell, Derbyshire. Will was a talented and intelligent boy who played the piano and was good at his school work. He enjoyed painting, sketching and writing about the Derbyshire countryside, which he loved. Will was offered a place at the grammar school but being the generous, caring person he was, he chose not accept it. Instead, from the age of 14 to 28, he worked at the coal face in the local Whitwell coal mine helping to support the large Streets family. Nevertheless, he still made time to keep up his interest in classics and French. After his daily shift at the mine was over he would carry on his studies with the help of his mentor John Mills. He also devoted his time on a Sunday to be a teacher at the Sunday school in the Whitwell Wesleyan chapel. Will hated the idea of war. But soon after war was declared in August 1914 he signed up as a volunteer to serve in His Majesty’s Army. Like so many men he responded to the call for men to join the British Army. Hundreds of men queued up to enlist. A recruiting office at the Corn Exchange in Sheffield opened on 10th September and the response from the men of Sheffield was so enthusiastic that within two days of the recruiting office opening the new battalion had reached its full complement of 1,000 men. Placards at the office were put up with the words “To Berlin - via Corn Exchange”. Will was one of hundreds of men who went there to join up. He enlisted in the 12th (Service) Battalion York & Lancaster Regiment with the regimental number 12/525. 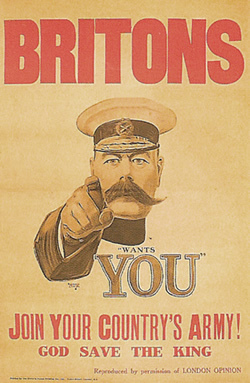 The illustration featuring Lord Kitchener “wants YOU” by Alfred Leete. The 12th (Service) Battalion York & Lancaster Regiment was one of the battalions formed at that time in the British Army made up of men from a specific area, workplace, profession, football team and so on. These battalions became known as the Pals Battalions. The battalion that Will joined was filled with men from the Sheffield area. Many of the recruits were professional men and office workers. Many had had been to public schools and universities. This battalion also accepted men from the Pennistone railway and local coal mines. One of these miners was Will Streets. The battalion was called the Sheffield City Battalion and later it became known as the Sheffield Pals. Will spent the next 15 months training with the battalion in England at Penkridge Camp (near Rugeley), Ripon and Hurdcott Camp (near Salisbury). During this time he wrote a number of poems such as “Hymn to Life: Hurdcott Camp” in November 1915. Will also wrote numerous letters to his family and he urged that his parents should face the possibility that he might not come home. Three of his brothers had also volunteered to serve in the Forces. In December 1915 Will sailed with the battalion for Alexandria in Egypt as part of the 31st Division. Once there the task was to build up the defences to protect the Suez Canal. After two months the 31st Division and Will's Sheffield City Battalion was on the move again, this time to France and the Western Front. At the beginning of April 1916 the battalion had arrived in the area of Colincamps behind the British Front Line on the Somme battlefield. The following weeks of April, May and June were spent training and making preparations for the planned large-scale offensive against the German Army. Will found himself in a very active sector of the battlefield west of the heavily fortified village and German Front Line at Serre. Behind the British Front Line the men of the Sheffield Pals spent this time at a training ground marching and practising for the attack. They practised how they would move up to their assembly trenches in Companies the night before the attack. They also took part in exercises where the whole of their 94th Brigade of four battalions took part. During this busy time Will wrote poems and ideas in pencil in a red-covered pocket-book. Now and again he sent some poems home. The closeness of death is found in his writing but there is no anger or bitterness. In the days leading up to the planned date of 29th June for the British offensive against the German line the weather was stormy and unsettled. The attack was rescheduled to the morning of 1st July. The photograph shows a panorama of the area across which the Sheffield Pals were to attack (from the left at John Copse to the right of the photo and Serre village) on the morning of 1st July 1916. Sheffield Memorial Park has grown over the site of three of the four copses on this battlefront: Matthew, Mark, Luke and John. The site of Matthew Copse is located in the fields to the left of the photograph. 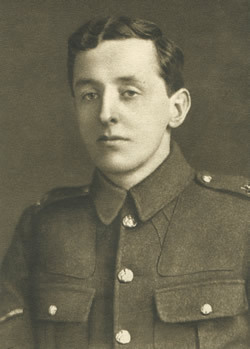 On the night of 30th June Sergeant Will Streets moved into the assembly trenches behind John Copse with his comrades in the Sheffield City Battalion. Having the rank of Sergeant he would have been in charge of men. The Battalion War Diary (2) reports that the trenches were blown in and badly smashed up. Some of the damage was due to the bad weather that week as much as the enemy artillery shelling. At 07.20 hours the first wave of A and C Companies clambered out of the Front Line trench and crawled into No-Mans-Land. They were lying about 100 yards in front of the British Front Line trenches. They were under cover of the British artillery bombardment, which was firing over their heads onto the German Front Line and rear positions. Casualties were reported as not being too heavy at this point. At 7.29 hours precisely the second wave of men, which is believed to have included Will, moved forward and lay in position about 30 yards behind the first wave of Sheffield Pals already lying ready in No-Mans-Land. The third and fourth waves began to move forward from their assembly position in the trenches a few hundred yards west and to the rear of Mark and Luke Copses. At this point the German artillery began to fire a barrage of shells starting at the rear of Mark Copse and rolling forwards onto the British Front Line position. Will was wounded and made his way back to the British line to get his wound seen to. He was seen going to help another wounded man but he subsequently disappeared. The casualties of this battalion were very heavy. The German wire had been found to be almost intact as it had not been damaged by the British artillery shelling during the 7 day bombardment in preparation for the infantry attack. In addition the German machine guns had caused many casualties to the British. Whole sections of men were wiped out before they even reached the German uncut wire. The battalion War Diary (4) reports that the few survivors who were not cut down by the German machine guns sheltered in shell holes for the rest of the day and made their way back to the British Front Line after darkness had fallen. John Copse was full of wounded. The next day, 2nd July, the War Diary states that two patrols went out into No Mans Land to assess the situation. Some more wounded men were found and brought in. These men stated that any men who might have made it to the German trenches were casualties and were no longer in the fight. The casualties of the Other Ranks who were missing numbered 373. Sergeant Will Streets was one of these men. Headstone for Sergeant John William Streets, believe to be buried in Euston Road cemetery. Will’s body lay unrecovered and missing in No-Mans-Land until 1917 when the fighting moved across this area again. His body, along with others, was recovered. On 1 May 1917, exactly 10 months after he died, his body was identified and he was officially recorded as “Killed”. Will was aged 31 when he died. In May 1917 a collection of his war poems was posthumously published under the title “The Undying Splendour”. 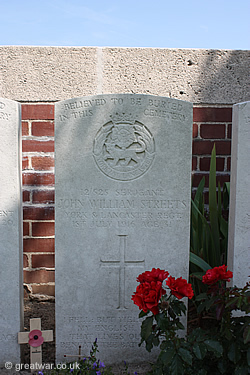 John William Streets was buried at Euston Road Cemetery, Colincamps. (Reference: Special Memorial A. 6.). The headstone states that he is believed to be buried in the cemetery, as presumably the marker for his buried remains was lost at a subsequent point in time after he had been buried here. Website about the history of the 12th Service Battalion York & Lancaster Regiment. The information is drawn from Richard Sparling's book published in 1920. Harold Streets, nephew of John William Streets.